The Airbus A380 is the world’s largest passenger aircraft. On my recent trip to Los Angeles, I had the opportunity to go behind-the-scenes and see this massive plane from a perspective unavailable to regular passengers. Qantas, Australia’s largest airline and the third-oldest in the world, flies multiple daily flights to Los Angeles International Airport from Sydney, Melbourne, and Brisbane. Generally, two of these flights are operated by the A380 and because of the time zone differences, the planes spend most of the day on the ground at LAX. A friend who works at LAX was kind enough to offer a tour of the plane, a rare treat for a lifelong aviation enthusiast like me. Now, as the planes had a long layover, Qantas uses this time for maintenance and a deep cleaning. The planes had only just arrived and so they were pretty untidy when I viewed them. Normally, the interiors are immaculate, so don’t let these pictures affect your perception of the airline. With 40% more usable floorspace than the Boeing 747-400, the Airbus A380 is the world’s largest passenger aircraft. Two decks running the entire length of the aircraft can accommodate up to 800 passengers, although Qantas has just 484 passengers in four cabins: First, Business, Premium Economy, and Economy. The aircraft is 72.7 meters (238 feet) long with a 79,8 meter (261 foot) wingspan. There are 14 exit doors, 4 engines, and the aircraft range is 8,500 miles. While the Boeing 747-8 is slightly longer, the Airbus A380 is overall a larger aircraft. My walk around the plane took several minutes, as the plane is so large, it is difficult to take in its full size, especially when you are up close. Looking up at the tail, which reaches 24.5 meters (80 feet) tall, gives you some sense of the scale we are talking about. While there were two A380s parked at the airport, we visited Nancy-Bird Walton, the first A380 delivered to Qantas. It was the 14th overall A380 built and its first commercial flight with Qantas was October 20, 2008. Interestingly, this plane suffered an uncontained engine failure on November 4, 2010 and made an emergency landing in Singapore. There were no injuries, but repairs to the plane took more than 16 months and cost more than US$140 million. It has served safely ever since returning to the skies in April 2012. Climbing nearly three stories to enter the plane, you get a sense of the massive size of the wings. Even with more than four decades’ experience flying and sufficient knowledge of the principles of aerodynamics, I am still amazed that something this large can take to the air! Entering on the main deck, a left turn leads us to the intimate First Class cabin. There are 14 individual seating pods, which offer privacy but are not as enclosed as on many of the Middle East carriers. I like this balance because on the carriers with “suites”, you feel like you are stuck in a cubicle at work, albeit a very nice one! The 22-inch wide seats rotate to the side and then recline into a fully-flat 79-inch bed. In this mode, you feel very like you are in your own cocoon. When you are ready for bed, the flight attendants add a mattress and a duvet, so you will sleep cozily. Round-trip tickets between LAX and Australia run about US$23,000 in this cabin, so of course the experience is luxurious. Heading towards the back of the plane on the main deck are two massive Economy Class cabins. Each has 17.5-inch seats in a 10-abreast configuration. Each seat has its own touchscreen monitor with loads of free entertainment. While the seats are comfortable enough, especially with the adjustable headrest, at just 31″ pitch (the distance between the same point on two rows of seats), I would find this a tad too cramped for a 14-hour flight. At the rear of the main deck is a spiral staircase that takes you to the upper deck. Hidden away at the rear of this upper deck is a smaller Economy Class cabin. With just 30 seats and a large exit row, these are the seats you want if you have to travel on a budget! Just ahead of the small upper deck Economy Class is Qantas’ Premium Economy cabin. These seats are arranged just seven-abreast and at 19.5-inch width and about 38″ pitch, are equivalent to First Class seats on a domestic flight. With only 35 of these seats in this mini cabin, this would be my choice to enjoy some comfort on a long flight without breaking the bank. Ahead of the Premium Economy cabin are two Business Class cabins, seating a total of 64 passengers. The seats are arranged in pairs, six-abreast. This layout, which has been in place since the introduction of the A380s, will soon be replaced with a new layout which allows each passenger direct access to the aisles. Truthfully, though, I prefer this type of pair seating as it feels less confined to me and is a better arrangement when traveling with another person. Even which the seats are reclined, it is not difficult to get to the aisle. So far, everything I have shared is pretty visible to the average passenger, although they don’t let you ramble about on the tarmac! So let me share some of the behind-the-scenes views. In the middle of the main deck is a door that looks like a regular lavatory entrance, except it has a combination lock on it. Open the door and there is a hatch in the floor and a ladder descending into the cargo hold level. Descending into the belly of the plane, there is a flight attendant rest compartment, that has 12 bunk beds, private pods in which the crew can sleep during the flight. Long-haul crews are assigned rest periods of several hours and they can choose to rest here. Each bunk has a curtain, reading light, and other amenities. They are small places, similar to the capsule hotels in Japanese train stations, and the one wedged in under the stairs has barely any room for your feet. There are also four economy class seats in the back of the galley located at the rear of the upper deck. With curtains for privacy, these seats allow another place where flight attendants can sit between performing their duties. Another hidden space at the front of the Business Class cabin is the purser’s station. This small workplace and several storage closets are cozy, but provide extra space for the crew. It is worth mentioning that on Emirates, the Dubai-based carrier and the largest operator of the A380, this space is used for showers for First Class passengers. We also explored the flight deck, which is located several steps above the main deck. When you go through the first door (in which I was standing as I took this picture), you enter an entirely self-sustaining area. To the left (at the top of the hand rail) is a lavatory for the pilots and to the right are two pilot rest areas. The pilot rest areas are stacked like two puzzle pieces. Each contain a comfortable chair, similar to a Premium Economy seat, and a bed. The A380 flies with four pilots and they work in shifts. All four pilots are seated in the cockpit during takeoff and landing, but during the cruise phase, the off-duty pilots can go to the rest areas if they wish. The A380 uses a “glass cockpit”, which means that instead of dials and gauges, monitors display all the primary functions of the plane. Additionally, all Airbus planes use a “joystick” device (visible to the right of the co-pilot’s seat) instead of a yoke or control column. Of course, my childhood dream was to be a pilot and I am jealous of the view that my friends who are pilots have from their office windows. To get a sense of just how high up you are in the A380 cockpit, I leaned out the window for a selfie! Must be careful not to mess up my hair. After poking around a bit more, we climbed down from the plane. I walked underneath, which is high enough to walk under without ducking, but low enough that you can reach your hand up and touch the belly of the plane. The view above is of the main landing gears: four bogeys with a total of 20 tires. These wheels are about as high as my sternum. Combined, they can handle up to 575,000 kg (1,268,000 lb) maximum takeoff weight. The view looking forward to the nose wheel. In the distance, a Qantas Boeing 747-40 sits in the hangar, undergoing maintenance. I hope you enjoyed this behind-the-scenes tour of the A380. Many thanks to my friend at Qantas for giving me this unique experience and I hope that one of these days, I have the opportunity to fly Qantas across the Pacific. 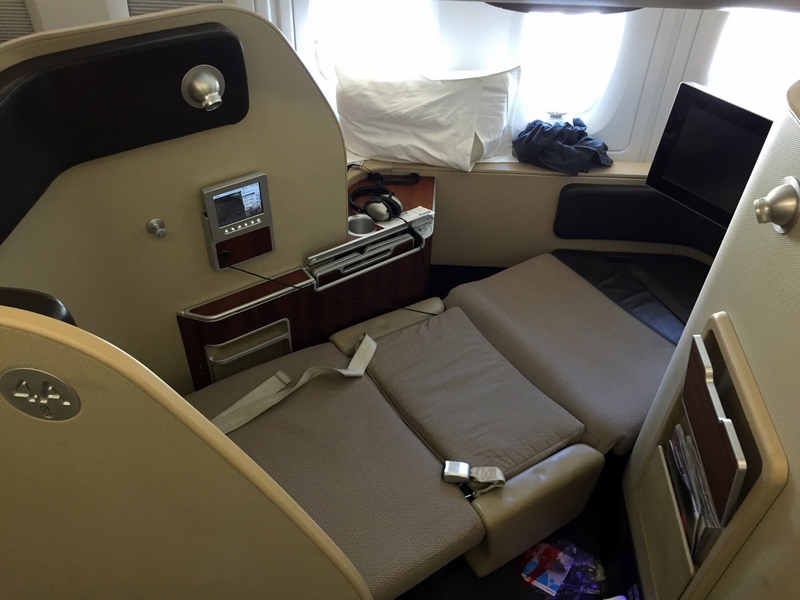 Learn more about the Qantas A380 experience here. This entry was posted in Aviation and tagged a380, airbus, aircraft, airplane, LAX, Plane, Qantas, QF by christao408. Bookmark the permalink. This is awesome. I’ve been waiting for your write up. How does one get into the pilot’s seat, does it slide back? Yes, pilot seats slide back and to the outside. Ah, I had the menus but handed them to a friend. If I recall, First Class was very lavish including a caviar course. Business Class included a choice of four entrees for the main meal, and even Economy Class featured three entrees plus the ability to pre-order certain meals. I was hoping they would have dimsum carts going up and down the aisles. Premium economy is still too expensive for me! Actually, at those prices, all of the classes are too expensive for me! What a treat to be seeing all this. I felt like I was seeing stuff I shouldn’t see, because whilst sitting on a plane, they have these places covered. It was a nice surprise to see Tawn in one of the pics lol. I’m happy for you that you got to see all this and even sit on the pilots seat. What a massive plane – I’ve been lucky enough to travel on the A380 (one of the perks of Australia being so far away? I take it they usually use these planes for long routes). Yes, there are a number of A380 services to Australia. While I enjoy upper deck Economy Class seating, the main deck is so massive. I haven’t been on an A380 yet. Maybe one of these days we can all sit in first class. What a great opportunity! I especially like getting to see the crew rest areas and the staircase into the belly. I once got a similar tour of a 747 – I even got to climb a ladder up into the tail (the claustraphobes out there would be like “nope”). Thanks for the post. I enjoyed it! I haven’t visited in awhile and I often forget about all the bloggers I’ve enjoyed … so I’m subscribing. Fantastic. Welcome back and I am working to increase my blogging not frequency. this is such a treat. and the treat is even more special with the fact that you get to see the hidden crew resting area. that is something that i have always been curious about. and i learned something new too, that there are four pilots per long haul flight, taking different shifts. i have always thought they would always have only two pilots. thanks for sharing this experience of yours. though i may not be as an avid fan for the world aviation as you are, i have always taken the liking of any ‘behind the scene’ world. it gives me a better understanding on how things operate. Glad you enjoyed it, Rudy. Yes, for long-haul flights there needs to be extra crewing to adhere to both federal safety and union rules. For medium-haul flights, there are usually three pilots. Long-haul, you will have four. i see. i learn new things every day. thx.